We are an actual local Houston charity, not a for-profit middle-man like many other donation centers. This insures your donations or the proceeds from your donation go directly to those in need, not overhead or outsourcing. When the Charity that Juan Altamirano Jr. was working for had to close its doors, Juan felt compelled to continue finding a way to help local Houston families in need. So he got together with his father, Juan Altamirano Sr. to open Local Houston Charity, Inc.
Local Houston Charity, Inc. is a 501(c)(3) registered charity that focuses all its efforts on assisting local Houston Area families in need. They have opened a Thrift store on Richey Rd. and offer FREE donation pick-ups all over the Greater Houston area. CLICK HERE to see a map of days for pick-ups and contact Local Houston Charity, Inc. today to make a donation to help local families in their moment of crisis. Our charity is made possible by your generous donations of clothing, furniture, appliances, left-over garage sale items, home-decor items, utility items and vehicles etc. All of which we collect daily through our prompt and scheduled donation pickup service. Just check the map to see what day of the week we service your area. We provide local Houston families with furniture, clothing, and household essentials. Your donations help those families suffering from a hardship or crisis. If you are suffering from a hardship or crises, we can help. For assistance please fill out THIS FORM. Local Houston Charity also welcomes referrals from all churches or non-profits in the Greater Houston Area. Should a church, organization or non-profit group become aware of a family in need, that organization can refer the family for assistance. The organization should provide the family with a letter of referral written on the organization's letterhead. Referrals should include the organization's contact information, type of assistance needed and a brief summary describing the crisis situation. No matter where you are in the Greater Houston area we can come pickup your donations. 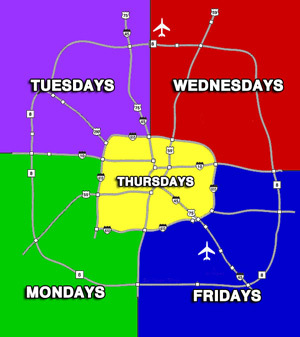 The map below shows what days we pickup in the various areas of Houston. Click on the map and it will take you to our donation page where you can schedule your pickup. Your generosity in helping local families in need is greatly appreciated. Many blessings to you. No matter where you are in the Greater Houston area we can come pickup your donations. Copyright © 2016 Houston Local Charity. All rights reserved.